It goes against nearly all of my instincts as a sports fan and writer to buy into narrative concepts such as heroes and villains. An athlete who ditches his team for a better situation is not suddenly a bad guy just because some Twitter users and columnists decide he is, and public opinion doesn’t really affect what happens on the field or court, anyway. Look, man, it wasn’t that long ago that LeBron James admitted that trying to be the villain in Miami fucked with his head and messed up his game. And LeBron James is one of the most unstoppable forces in basketball history! Kevin Durant is a great player, but he’s also the guy whose relationship to his own personal brand has been as tortured and perplexing as possible, and now he’s wigging out after just one loss. 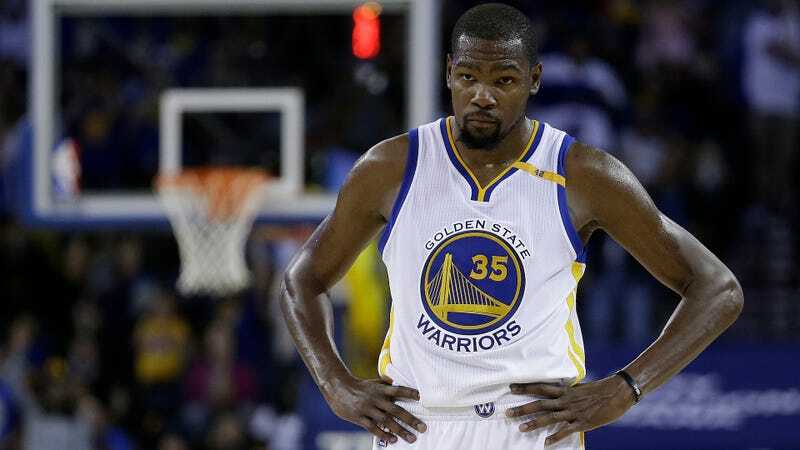 If the Warriors lose tonight, expect Durant to show up at the next practice sporting a face tattoo that represents how he never stops grinding even when the haters don’t want him to be great, or something.